The U.S. president’s hobnobbing with corporate chiefs is largely a one-way street. Executives can claim some impact on China policy but not yet on immigration, and they got stiffed on climate. The White House forums are still useful for their insight into administration thinking. 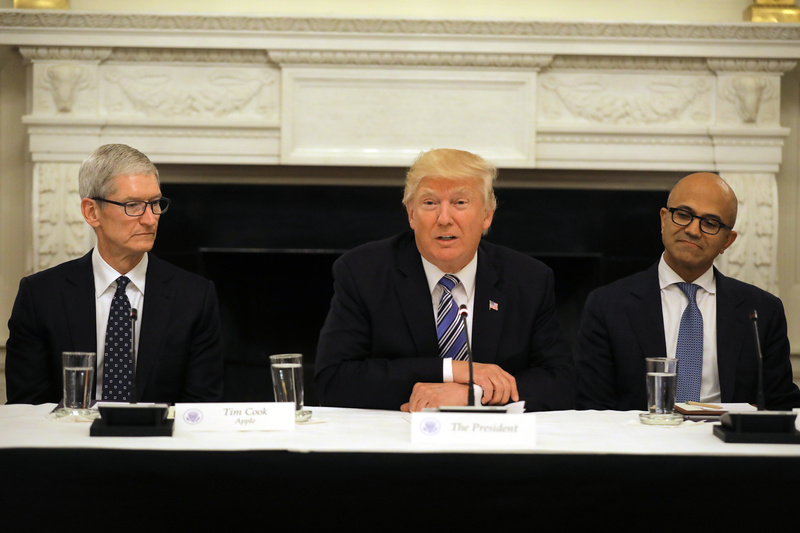 U.S. President Donald Trump participates in an American Technology Council roundtable, accompanied by Tim Cook, CEO of Apple (L) and Satya Nadella CEO of Microsoft Corporation at the White House in Washington, U.S., June 19, 2017. U.S. President Donald Trump met with executives in the technology sector on June 19 to discuss modernizing the government and reducing waste. Amazon CEO Jeff Bezos, Apple CEO Tim Cook and Microsoft CEO Satya Nadella were among the attendees. Several of the executives pressed Trump on the country’s need for more highly skilled immigrants. The president ordered a review of visas for such foreign employees to curtail abuse and see if they are hurting American workers. Facebook CEO Mark Zuckerberg was invited to the meeting but didn’t attend due to a scheduling conflict, his company said. Tesla CEO Elon Musk dropped out of the technology council after Trump said on June 1 he was pulling the United States out of the Paris climate accord. Disney CEO Bob Iger quit another White House business advisory council because of the president’s Paris decision.